On my last day in India, I spent my free hours exploring Delhi. Capital of this land of more than 1.2 billion people, Delhi is more than 570 square miles and was established in 736 AD, though some of its relics date the city back to circa 300 BC. After having spent the day before with a tour guide, who, while instructive, was a bit exhausting, I elected to lead my own explorations. It’s possible to safely get about Delhi via taxi, subway, and auto rickshaw, but I splurged and hired a driver from my hotel for my journeys. The driver, a knowledgeable man from the Punjab region named Inder Pal, cost about $68 plus tip for four-and-a-half hours. It was money well-spent, as Inder Pal was a great driver, whizzing me around with efficiency, waiting for me while I explored various spots in the city, and surprising me with cold water and cool towels to counter the oppressive heat. The first part of my trip about town had me buzzing about a neighborhood of furniture and interior design shops, looking for a mirror for my daughter’s bedroom. I eventually found it—in another neighborhood, at the end of the end of the day. 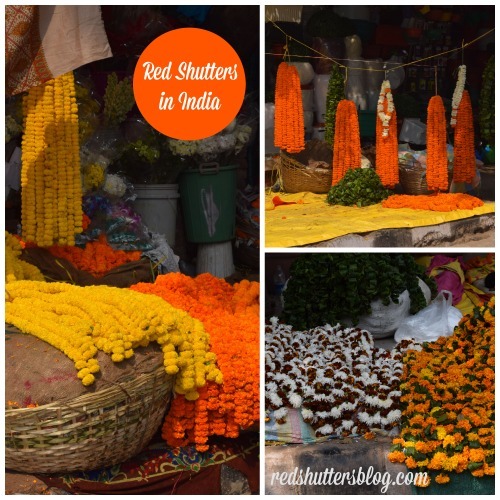 I enjoyed seeing a bit of a non-touristy area, especially the many flower sellers who lined the streets, selling Diwali decorations. 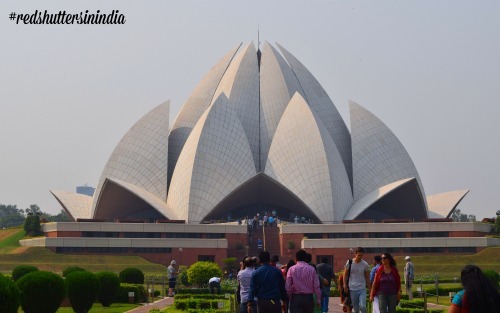 Next, I headed to the Lotus Temple, a famous Baha’i House of Worship that is shaped like—you got it—an enormous lotus flower. The Temple’s shape is striking. I appreciated the flower inspiration, but part of me expected the Temple to launch into outer space, like a sci fi movie! I wandered around the grounds and walked up close to the Temple, electing not to go inside for the tour. The space is basically one large room that you can see from the outside, through the glass walls; I wanted to see more of Delhi—plus there was a line of people waiting to get in. 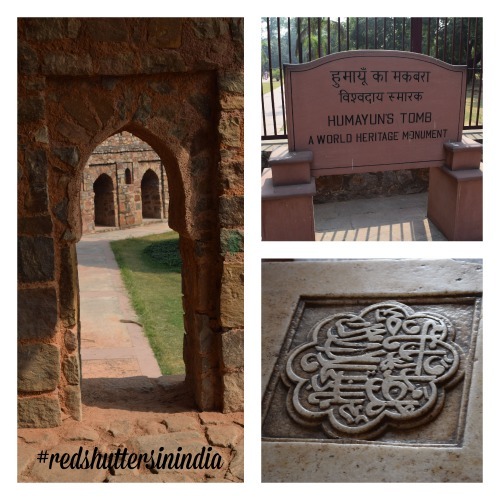 We braved Delhi’s traffic to head next to Humayun’s Tomb, where the second Mughal emperor is buried. The Tomb is an inspiration for the Taj Mahal and was built in 1565. 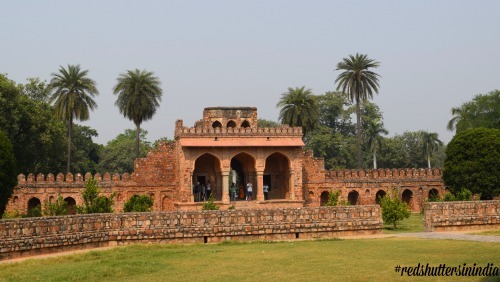 The Tomb is the resting place of Emperor Humayun as well as his wives, scholars, and even his favorite barber. A stop at the Tomb had been recommended to me by someone I follow on Twitter who used to live in Delhi, and it was well-worth it. I was a bit of an anomaly exploring the grounds on my own, but I didn’t mind. I found the Tomb oddly peaceful and quite beautiful. 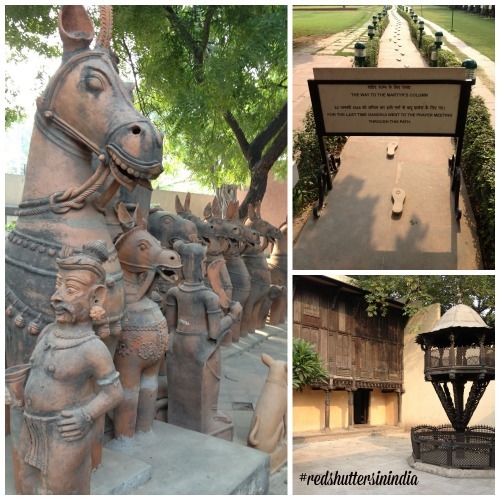 A visit to Gandhi Smriti, a museum dedicated to Mahatma Gandhi, was my next stop. Here Gandhi spent the last 144 days of his life before being assassinated in 1948. The site focuses on the injustices forced upon Indians during the British Occupation, the resulting revolts, and Gandhi’s leadership and inspirational life. Afterward, I had my driver drop off at the Crafts Museum. My guidebook said that the gift shop here was worth visiting, and it was right—though the prices were higher than the spots in the market and there was no negotiation (by this time, I was into the negotiations!). The Museum was hosting a textile exhibit while I was there, with works from all over India on display; there was gorgeous embroidery, scarves, saris, and more. The Museum also has a robust array of saris in its permanent collection and a traditional Indian home on display. Afterward, at the suggestion of one of the attendants in the Museum’s gift shop, I headed to Sunder Nagar, a nearby neighborhood, for a bit of shopping and to finally find that mirror for my daughter’s bedroom. I passed Purana Qila and the Zoo on the way there. I picked up some gifts for family members in Sunder Nagar, spending the late afternoon wandering about. I also saw crowds of people heading into a bakery to purchase Diwali treats. You could feel the excitement! An auto rickshaw brought me back to my hotel to pack and get ready for my departure home early the next morning. I had a busy day exploring Delhi, and I left knowing there was much I did not get a chance to see. 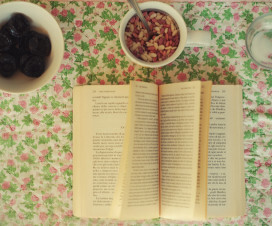 Next time, I hope! I have been to the Baha’i temple grounds in Haifa, Israel, but non-Baha’i were not permitted inside the temple. The grounds were just stunning though. The Baha’i have a strong belief in symmetry, and they were able to convince leaders in Haifa to move a major road so that things were more symmetrical. I will have to show you a picture sometime!